Colour photograph of the Totten Sims Hubicki Associates Ltd facility in Whitby. Totten Sims Hubicki Asociates was an engineering firm, located on Hopkins Street in Whitby. 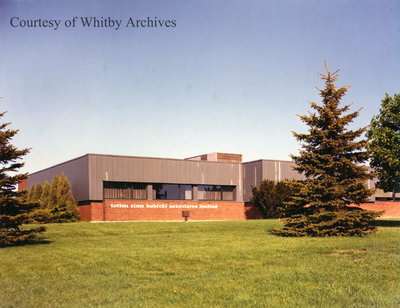 This photograph is one of 19 promotional photographs highlighting a variety of Whitby's buildings and spaces, including businesses, Town facilities, and industry. Totten Sims Hubicki Associates Ltd.
Totten Sims Hubicki Associates, ca. 1983, photographer unknown. Whitby Archives photograph D2016_004_013. Scanned from photograph on hardboard. Originals have been deaccessioned.